Sadly [or not, depending on how one looks at it in hindsight], I wasn’t able to watch the entire film back then. This was in the good old days before invertors, so when the electricity went kaput halfway through the film, that was it. I relegated Baazi to the list of films I had to look out for and watch someday. I found it the other day on YouTube. The film (which, by the way, was produced by Johnny Walker’s brother, Tony Walker aka Kamaluddin Kazi) hits the ground running. This story is set in Goa. In quick succession, we are introduced to a whole bunch of characters. There’s Joe (Johnny Walker), for instance, who is an insurance agent and quite a ladies’ man. 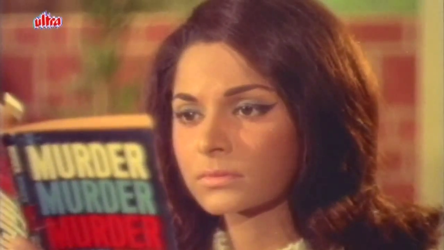 Joe stays at a boarding house run by a Lucy Fernandes [Shammi, in a bad wig—bad wigs are the order of the day in Baazi, (dis)gracing everyone from poor Waheeda Rehman to Manmohan]. Lucy is smitten by Joe, totally unaware that her younger sister Susan ‘Suzie’ [Helen, who somehow managed to carry off even pretty bad wigs] is also in love with Joe—and vice-versa. 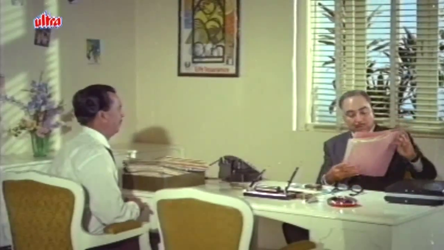 The film begins with Joe chatting with his boss at the insurance agency. The boss is suspicious about an insurance policy which has been bought by a certain Mr de Silva. De Silva has insured himself for the whopping sum of Rs 2.5 lakhs, and the beneficiary of his policy is his niece, Elizabeth de Silva. Elizabeth de Silva, wonders Joe? Why, there’s a fellow lodger at the Fernandes sisters’ lodging house, named Elizabeth de Silva (Waheeda Rehman). Could it be the same woman? Joe’s boss says this must be investigated because it sounds fishy. 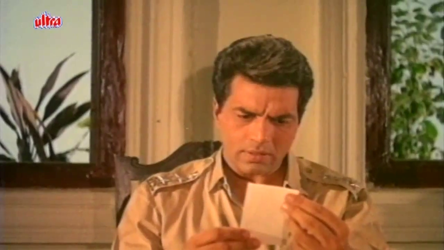 Meanwhile, the scene shifts to Ajay (Dharmendra), a Deputy Superintendent of Police. Ajay is Elizabeth’s boyfriend [and, in an unusual departure from the norm, we aren’t treated to interminable scenes of fake arguing, stalking-disguised-as-wooing, and too many details about the progression of their romance]. Ajay attends a charity show in which Elizabeth ‘Liz’ and Suzie are dancing [respectively as Snow White and her evil stepmother]. After the show, Joe turns up, festooned in false beard and wig, passing himself off as a journalist and trying to get an interview with Liz. The interview, to Liz’s surprise and annoyance, turns out to be more about her uncle than her. Joe doesn’t learn much, and is soon kicked out. There’s a brief interlude in which Ajay and Liz get engaged [not at a fancy party with Liz and/or Ajay playing the piano, but on the beach, all by themselves, with Ajay slipping a ring on to her finger]. 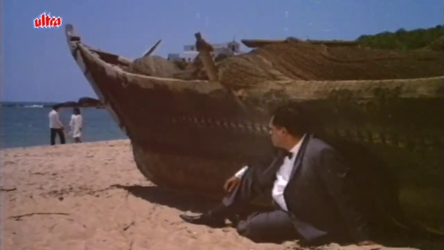 Neither of them realizes that a sinister someone hiding behind an upturned boat is watching them all the while. Punctuated by some unnecessary and irritating scenes regarding Joe, Lucy and Suzie and their tedious love triangle, the story now proceeds with leaps and bounds. The day after they get engaged, Ajay receives a telegram from Liz, followed by a phone call from her. Liz is distraught and tells him that the previous evening, after she’d got home, she’d received news that her uncle was ill. When she reached Uncle’s home, she found that he’d had a heart attack, and now he’s dead. Ajay gets Uncle’s address from Liz, and sets off at once. Little does he realize that he’s being watched by someone [Ulhas; we are never told this man’s name, and since there are others of his ilk popping up every now and then, I’m going to arbitrarily assign names. This one, therefore, I dub Shady Character#1]. Further along, Shady Character #2 (Jagdish Raj) has strewn tacks on the road; Ajay drives on, has a flat tire, and is therefore delayed somewhat. Driving on after repairs, Ajay stops to ask for directions from a passing motorcyclist (Shady Character #2). Shady Character #2 points him to an imposing and fascinatingly historic-looking mansion down a rather lonely lane. 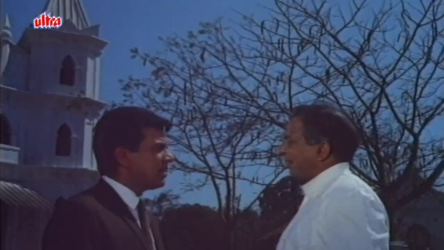 By the time Ajay arrives at Mr de Silva’s house, it is past sunset. Inside, he can’t find Liz, though he calls for her. 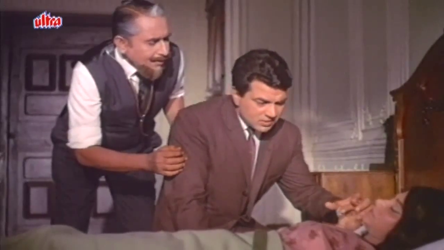 Instead, a doctor [NA Ansari, so you can safely assume this is Shady Character#3] appears, and shows Ajay Mr de Silva’s corpse. Ajay has barely had time to nod sadly when the doc also shows him Liz, who has collapsed with the shock and is currently out for the count. No chance of her helping out with Uncle’s funeral. Ajay asks what he can do to help, and the doctor suggests he go to the church nearby and search out the priest to arrange for the funeral: the sooner it’s done, the better, since Uncle’s corpse won’t last long. Ajay is fortunate enough to find the priest (Nasir Hussain) outside the church. 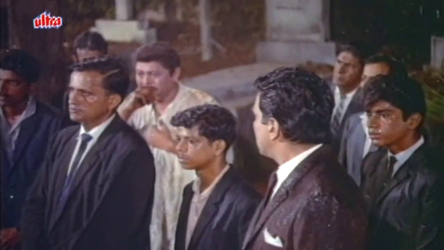 They have a quick chat, Father Gonsalves expresses his sympathy, and reassures Ajay that he will arrange for the coffin, the pall bearers, everything. So—while Liz still sleeps on—Ajay attends Uncle’s funeral [at night? Not something I’ve seen] and sees Uncle ritually interred, while the priest rattles on in Latin and a bunch of mourners stand around looking solemn. Suddenly, a drunk interloper (Manmohan, in a bad wig) arrives, weeping and looking very out of place among the suited-booted fraternity. Ajay whispers to the man beside him, asking who this newcomer is, and is told that he’s a poor man whom Mr de Silva had been very good to. There’s more in store for Ajay. Back at Uncle’s mansion, he finds Liz, now conscious; after consoling her and letting her know that Uncle has been given a fitting farewell, he retires to his room. And, looking out of the window a while later, sees a woman hurrying away towards the nearby cemetery. From this distance [and in the night, too? Ajay has phenomenal eyesight] she appears to be Liz, so Ajay follows after…and finds her weeping on Uncle’s grave. Poor Liz! But no. When Ajay reaches out and touches her shoulder, the woman whips around, and Ajay realizes he’s mistaken. The woman (Chand Usmani) is a complete stranger. The next morning, when Ajay tells Liz of this odd encounter and wonders aloud who this strange woman mourning Uncle could be, Liz recalls having heard rumours that Uncle had been having an affair with someone. Who, she does not know. What Liz is more interested in, it turns out, is the money she will inherit now that Uncle has copped it. [For a Hindi film heroine, Liz is surprisingly mercenary; she’s out shopping and rejoicing over her newfound wealth far too soon for comfort. When it comes to grieving for the dearly departed, our girl obviously believes more in quality than in quantity; one day’s focussed weeping and fainting away is enough]. Ajay, having phoned his boss and asked for a few days’ leave, stays on in order to comfort Liz [who, in any case, is more interested in going shopping, once she’s received an advance on her inheritance from the lawyer]. While Ajay is there, a newcomer arrives: Joe, minus his moustache [and with the addition of a truly horrible wig], calling himself Liz’s cousin Joe from England. He tells Liz that Uncle had wanted the two of them to get married, which is why he’s come. Liz admits to Ajay that she does have a cousin Joe in England, but she’s never even seen a photo of the man, so this may well be him. At any rate, it gives Joe the chance to stay on [and presumably investigate the case, though the scriptwriter seems to forget that that is the reason for Joe’s coming here]. Once Liz seems to have sufficiently recovered, Ajay reports back on duty and is handed a case to be investigated. A distraught old man (Nazir Kashmiri) had reported that his elder son, Prakash, had gone missing. Prakash has a younger brother named Rakesh, a rotter who had left home years ago. Recently, in an attempt to bring the lost sheep back to the fold, Prakash had travelled to meet Rakesh—and has disappeared. Nobody knows where he is. The old man had reported this to Ajay’s boss, who had asked him to provide a photo of Prakash. Now the old man comes to meet Ajay, bearing with him a photo of the missing Prakash. And who should it be, but—Mr de Silva, whom Ajay has himself seen buried! Ajay is so flabbergasted, he asks some silly questions about whether this really is the old man’s son, a Hindu named Prakash, not a Mr de Silva? The old man is too sweet to punch Ajay and confirms that yes, hard to believe as it may appear, this is Prakash. And Liz, when shown the photo, dismisses it. That isn’t Uncle, not at all. And she hasn’t seen this man before. Up to this point, Baazi is pretty engrossing. A veritable whodunit, and one which raises loads of deliciously puzzling questions. Who are the shady characters spying on Ajay as he drove to Uncle’s mansion? Who was the mysterious woman sobbing over the faux Uncle’s grave? How did Prakash end up buried as Mr de Silva? The sad part is, the second half of the film—devoted to the unravelling of the plot, actually does allow the plot to unravel. Completely, until one doesn’t know where’s what. Important plot points fall by the wayside, holes riddle the story, and you realize that there’s a reason why Baazi, despite having a decent cast, is never mentioned in the list of great Hindi suspense films. Dharmendra and Waheeda Rehman, who look great, the latter despite some not very flattering wigs. Helen is lovely, though sadly wasted in what is too short a role. And, some of the songs, which were composed by Kalyanji-Anandji. Baazi isn’t one of those films with a brilliant score. But a couple of the songs—like Aa mere gale lag jaa or Main haseena naazneena—aren’t bad. The appalling wigs, for one. And more. The plot holes in this story make it almost sieve-like. Despite my oft-admitted love for suspense films (and for Waheeda Rehman, Dharmendra, et al), not a film I’d want to see again. Be warned. And it starts of quite promisingly, but then afterwards, I just couldn’t care. It was like if the makers don’t take their film seriously why should I care. Normally I would just stop and do something else, but nevertheless I held on till the end, hoping Waheeda and Dharmendra would together salvage the film, but it was beyond it. The ending though shot nicely, at least an attempt was made to pep it up, came only as a relief. And I couldn’t suppress a feeling, that the story-writer or whoever, just gave the characters Christian names to reinstate the usual cliches about the community. Thank God, at least Waheeda’s character gets to speak proper Hindi. Yes, the promising start – which was what I’d seen all those years ago – was what made me look out for this film and watch it. But so disappointing! And, actually, it’s not even as if the story fizzled out totally. After all, the end does have its surprises. All it needed was to be put together better. I could have said what needed pruning and/or explaining! Whatever. I agree that several of the more common cliches about Christians are repeated here – but thank goodness, Liz speaks proper Hindi and even wears saris in a couple of scenes. Had heard from my father that it was a terrible film, so never got around to watching it – despite the presence of Dharmendra, Waheeda, Helen and Johnny Walker. So this is another of your reviews, Madhu, where I do not have to moan, WDIGTT? :) Bad wigs – an entire series of films of a certain age suffered from them. It is almost as if the industry, enmasse, discovered wigs, and like children in a toy shop, decided to use them whenever and wherever they could! But a heroine named Elizabeth! Engaged to a Hindu man with not a piano or party in sight! And she doesn’t die in the end! How unusual! Thanks for the delightful review – I’ll steer clear of it. Yes, Anu, this one does have some refreshing departures from the norm. :-) Even though – as Harvey points out – it does reinforce several stereotypes about Christians. The very fact that the heroine isn’t shy about being mercenary enough to want to go shopping a few days after Uncle’s dead (and no excuses made for her love for money, either) is unusual enough. And she wears saris occasionally, and speaks proper Hindi. Not great, but ok as a time pass. I saw it twice on TV and thought it was passable. I do like the character of Liz, she is so unlike usual filmi heroines. The hero too, is intrigued by Liz, but never puts her down for what she is. The movie does get scary now and then. Yes, I liked that. He accepts her for what she is, and even though he does tell her once or twice that she really shouldn’t be so money-mad, it’s not as if he makes it his life’s mission to reform her. I watched this a few years ago and had the same reaction as you, Madhu – middling effort that wasted the potential of it’s high-quality cast and plot idea. The one area where we disagree is on Waheeda. I thought she was a complete miscast. She looked uncomfortable/awkward throughout the movie and turned in a fairly vacant performance, IMO, despite some interesting edges to her character. I think I’m rather in the minority when it comes to liking Waheeda Rehman in this film, Shalini, because I remember reading somebody else’s article (don’t remember who, or where) in which they said pretty much the same thing as you do re: Ms Rehman. I thought she looked quite pretty in most of her scenes, though I do think she was wasted. I mean, when you have such a good actress, to cast her in a film that requires very little acting ability… not done. 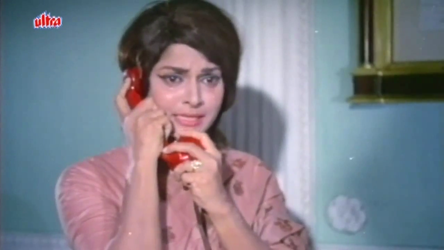 The telephone song is Pyaar ki yeh baatein humko na samjhaao. :-) Not bad, but not memorable, either. Give it a try! :-) It’s really not a bad film; I guess what irritated me was that it built up so well (it had potential, as Shalini says) and then it fell flat. The surprise end, though, is still interesting. If nothing else, enjoyable time-pass, as they say. The director is Moni Bhattacharjee, right? Well then I am not surprised the film went haywire, so did Usne Kaha Tha and Jaal. I do not know how he managed to get Mujhe Jeene Do right? I have a vague memory of this film being released and disappearing without making any impression at the box-office, I was very small then. I however remember seeing stills of Waheeda Rehman as Snow White in the film weekly Screen and being a child I was slightly curious. Well thanks to you I have now satisfied my curiosity. Thanks for your review and the warning. I can set a mental red flag against the movie and go on with my life. The only redeeming feature in the movie seems to be Waheeda Rehman but never could tolerate her in a wig. I think Anu remarked about how film makers seem to have taken to wigs with a vengeance in the 60s. They were all over the place, some truly horrible ones too (have you seen Kahin Din Kahin Raat? Biswajeet in a ghastly bronze one). Waheeda’s hairdos in Baazi are relatively tame (there’s one, where she’s got a short crop, which is actually pretty nice and suits her)… but really, the film’s not worth it, especially if you can’t abide Ms Rehman in a wig. Your review is so hilarious that it makes up for the movie with big plot holes and bad wigs. I see what you mean, from the screenshot with Johny Walker in the wig. I had never heard of this movie, the songs sound vaguely with a big V familiar. I remember the Helen, Waheeda song thinking what a waste of the two sisters singing together. Thanks for the laughs ! Well, i must say that this film rather had a good thrilling story but somewhere it is it’s screenplay which fails to deliver. Now this is rather unfortunate because usually Dhruv Chatterjee ( the story & screenplay writer) does a very good job, as is evident from the films Woh Kaun Thi, Shikar & Inteqaam. But surely something went wrong here, which is sad, for the story-line of the film actually had potential to become a very good film. Shikar and Intequam did have very good stories, and Woh Kaun Thi?, despite various plot holes, is one of my favourite films, so I won’t argue with that! But yes, Dhruv Chatterjee seems to have started off with a good story here but gone off the rails when it came to the scripting of it. Oh, yes. The director makes a big difference. 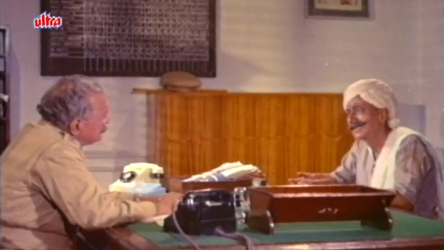 And Raj Khosla – like Vijay Anand – was certainly a master when it came to thrillers. Plus, as you point out, the music of Woh Kaun Thi?. Not one song is unmemorable. One of my favourite scores ever, actually. Absolutely.. 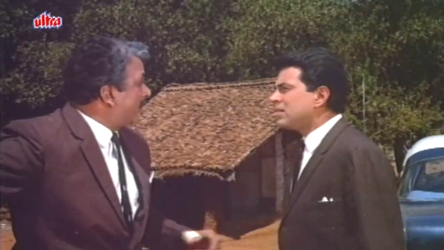 The success of WKT also lead it be remade in Tamil as Yaar Nee (1966), where too it proved to be a big success. And yes most of the songs of WKT were retained in the Tamil Version too. Oh, wow. That was very enjoyable – even if I didn’t understand a single word. Now I want to watch Yaar Nee. Your review was thoroughly enjoyable. I am of the same opinion about the unnecessary use of wigs. They have generally been unconnected to the story. I remember that one director inflicted a wig on even poor old A K Hangal. Then we have the Jumping Jack (Jeetendra) being made to wear wigs by most of his southern producers (Mawali, Himmatwala etc.). I wonder why top heroes put with this unartistic torture. Regarding crime thrillers of the 60s, I was thoroughly disappointed with the treatment. Aadhi Raat ke Baad, Gateway Of India, 12 O Clock etc have been total let downs because of the infantile direction. My reasoning for this poor storytelling would be the lack of exposure to world cinema by many of these directors. Even the evergreen Dev Anand was never noted for his directorial skills. It is probably Vijay Anand whose direction was far superior to Dev. A pity that he has not directed too many films. Yes, I too wish Vijay Anand had made more thriller/whodunit films. He’s so good with films like Nau Do Gyarah, Teesri Manzil and Jewel Thief – he pulls them off with a stylishness that few other Indian directors are able to manage.